The adductor muscles of the leg are located on the inside of the thigh and consist of the adductor longus, adductor magnus, adductor brevis and M. gracilis. They extend from the lateral, inferior pubic and front seat leg to the inside of the tibial plateau and the lower thigh bone. 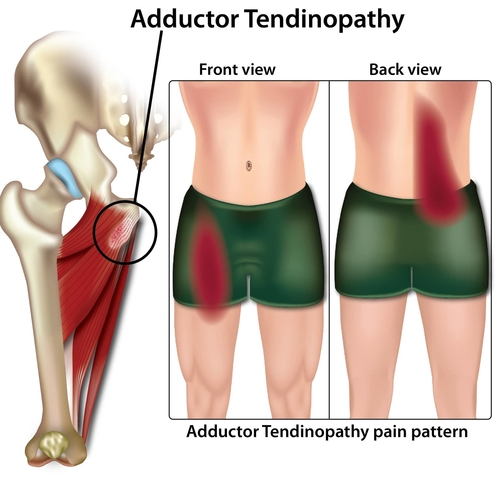 Adductor tendinopathy (also known as gracilis syndrome) is usually caused by an overuse of the adductor tendons and is usually characterised by pain at the point where the groin muscle attaches to the pelvis. This injury most affects those in sports such as horse riding, running, football, hurdling, and rugby. Adductor tendonitis is mostly caused by sport-related overuse injuries of the adductor tendons. This is usually insertional tendinopathy with local osteonecrosis (destruction of bone tissue) of the pubic bone. With runners, the most common causes of adductor tendonitis is overworking of the leg muscle and joints e.g., leg axis misalignments, intensive training without proper warm-up phase, muscular imbalances in the lumbar spine and adductor contractions. If the hip muscles are too weak and cannot adequately cope with the exercise the adductors have to take a high load than required to compensate for this deficit. Similar pain in the inner thigh (area of obturator nerve), which occur especially in stress on the adductors. A groin pain usually manifests itself when the muscles contract at the groin, which occurs mainly during intense exercise. This pain on the inside of the thighs can be caused by inflammation or permanent tension alongside muscle contractions caused in the adductors. In addition to runners, horse riders and footballers are largely affected by adductor strains due to the compression of the adductors while their legs are on the horse and for footballers because the adductors are required in the movement of the ball. Adductor syndrome – which in the first step general therapeutic approaches are used. Usually, a clinical approach is recommended for either with chronic complaints (pain lasting for more than 3-6 months) requiring special pain therapy and treatment. Medicinal Pain Therapy: In acute (sudden onset, severe) and subacute pain, pain relievers that act at the site of pain generation can be used first, these are mainly painkillers in particular NSAIDs. Severe pain, on the other hand, is mostly controlled by the use of central nervous analgesics (e.g. Tramadol, Valoron N) for effective relieve. At the risk of habituation or even painkiller addiction, there might be an exchange with antidepressants which could sometimes provide a pain relieving effects. Acupuncture: this form of therapy is sometimes useful at relieving pressure points which can provide temporary pain relief. Physical therapy: TENS, heat, Cold, massage, physiotherapy are well-known methods of treating the adductor muscles and tendons. Since a common cause of adductor tendonitis in sporting overload exists, runners should not return from treatment abruptly but gradually increase their training load as needed in order to ensure that the adductor muscles can regenerate and strengthen properly. Also, any necessary adjustments to footwear are also essential. The proper training shoes can prevent future groin strains which occur through improper loading due to leg misalignment. An adductor strain can also be caused by intensive training whilst the leg muscles are still cold and not warmed up. This can be avoided by participating in a minimum 15-minute warm-up session preceding the sporting activity. Ensuring that the adductor muscles are stretched effectively is also essential in preventing any further injuries.